As early as 1956 boys and girls between the ages of 7 and 14 were bused, transported by car, or walked to Camp Cayuga on the Lowell Road in Hudson. 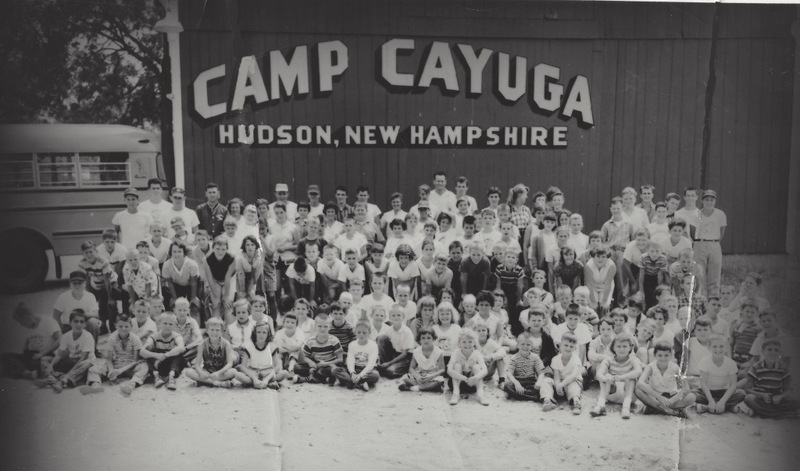 Camp Cayuga, a summer day camp, was operated by John S. Groves on his family’s 265 acre farm. The camp activities started at 9 am and ended at 4 pm. Each camper brought their own lunch except on Thursdays when there was a noonday cookout. The camping season was 8 weeks, during the months of July and August. As many as 125 plus children came from towns like Milford, Amherst, Merrimack. Lowell, Chelmsford, Nashua and Hudson. Camp facilities included a large barn for a place of assembly, a swimming pond on the property which was recently dug by a bulldozer along a brook which ran thru the property, bath houses, Indian camps where campers divided into tribes, playing fields, horseback riding rinks, and woods for nature study. Horse back riding was one of the more popular events. special events,such as horse shows, carnivals, and fishing derbys, were often held. The Groves farm was located on the western side of Lowell Road and extended to the Merrimack River. Until 1955 Mr. Groves had farmed the land and operated an automobile sales agency on the premises. He then turned from auto sales to teaching school. The idea of using the farm as a summer camp was suggested to him by a friend a few years earlier. The possibilities for expansion were considered as tremendous as within a 15 mile area there were 200,000 people and only 2 other day camps in the area. By Ruth M Parker in Lowell Road on June 26, 2015 .